Visit us in July and August from 10am to 10pm every day! There are interesting events in our museum. We have two exhibitions this summer. The first of them, Ante Brkan’s photo exhibition, is actually introducing the summer schedule. The exhibition is executed in collaboration with the Gallery of Fine Arts of the National Museum in Zadar and Betina Museum of Wooden Shipbuilding joins the 100th Anniversary of the birth of photographer Ante Brkan. The creation of our museum’s permanent exhibition was made possible thanks to the photographs owned by Betina Shipyard that the author had taken during his three visits to Betina in the middle of the past century. These photographs complete the narration of the history of shipbuilding in Betina in the 20th century. You can visit the exhibition by August 1st. In July, we’ll be doing some artistic workshops and first of them is children’s workshop Sea in my eye which will be held on the 13th. 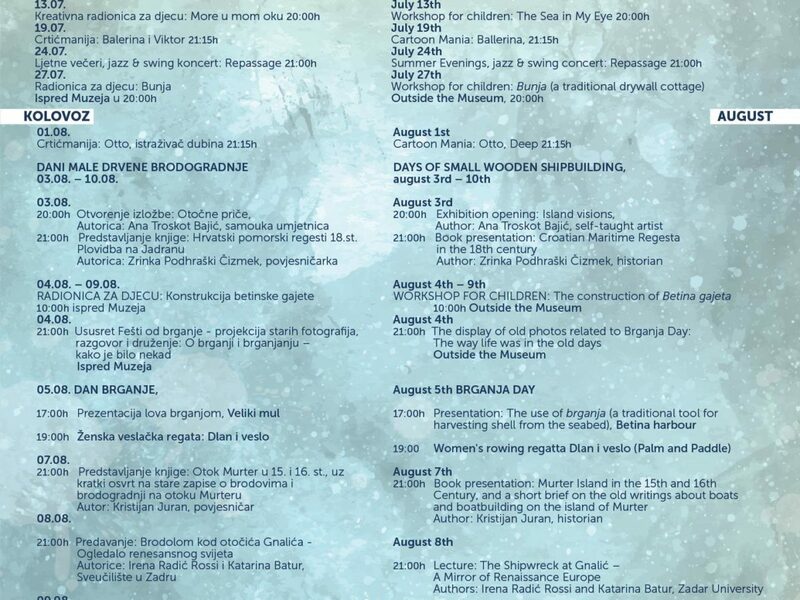 During July and August, the Tourist Board of Betina will have movie projections for the children in front of the Museum. In collaboration with the Museum of the City of Šibenik, we’ll have an educational workshop for children Bunja – we will learn about the traditional drywall cottages. In August, for the fourth time the Museum is the organizer of The days of small wooden shipbuilding. The event will be open on the 3rd – with the exhibition again! The name of the exhibition is Island stories by the author Ana Troskot Bajić, in her own words – a self-styled, free-styled artist who will show her vision of the island of Murter through beautiful sculptures of the island’s scenes. Maritime Historian, and by recent – Doctor of Science, Zrinka Podhraški Čizmek, will present a valuable work of the Croatian Maritime Regesta in the 18th Century – Sailing on the Adriatic. The author continues the work of her grandfather, Nikola Čolak, in the fifties of the 20th century, and deals with over 4000 documents about our history, captains, ships, merchants, stories and events throughout the 18th century. The book is actually the 3rd volume and continues on two books edited in the eighties and nineties, featuring a large number of documents attesting to the presence of Croatian captains and ships in the naval history under various flags – Venetian, Austrian, Osman and Dubrovnik. Lecture and the book promotion follows after the opening of the Island Story exhibition at 21:00. During morning hours of the event, from August 3rd to 10th, a technical workshop for children will be held. The workshop aims to teach and motivate the children for manual work and handling tools, but is primarily acquainted with the construction of a wooden boat. The number of children is limited and you must sign up for participation early! Before the event of Brganja Day we’ll hang out with our senior locals in front of the Museum. They will help us return to the time when they had to sail to bring food to the table. Last year we learned that they used to eat shells more often than fish, and this year we will certainly know more. We have also prepared old photographs for us to see the old, beautiful times again… On the Day of Brganja and again with the help of our locals, we’ll reenact the harvesting of seashells in Betina, and our volunteers will prepare a traditional meal for the rowers since afterwards starts the traditional women’s rowing regatta. It’s scheduled at 19:00. Evenings are reserved for the book promotions and conversations about boatbuilding. We look forward to the promotion of the book by Kristijan Juran, the historian from Murter – The island of Murter in the 15th and 16th century, followed with the author’s review of the old records of the boats that were built as well as the beginning of shipbuilding on our island. A very interesting presentation of the project Shipwreck of Gnalić – Mirror of the Renaissance world, will be held by Irena Radic Rossi and Katarina Batur from the University of Zadar. The project explores one of the most significant shipwrecks from the maritime past that brings us back to the late Renaissance period and the rich trading links of the Mediterranean with the East. The location of the shipwreck is found in the submarine island of Gnalić, near Biograd. The most significant find, along with many other valuable items, is certainly fifty meters of well-preserved damask fabrics carried by the ship Gagliana Grossa from Venice to Constantinople. The lecture is scheduled on August 8th at 21:00. We will also learn something interesting about ship’s eyes! Jere Bilan, from Zadar School of Naval Architecture, will tell us something more about their significance during history. We will guide you through our exhibition as well – on August 10th, two times – at 10 in the morning, and 18:00, free of charge! You can visit the museum accompanied by our professional staff presenting our exhibition in Croatian and English. The regatta Za dušu i tilo (For body and soul) is also an opportunity for you to visit the Museum under the promotional ticket price – which will be 15,00 kn for all visitors this day! The regatta will be held on the 19th of August.